Literal brothers, Alex (banjo and vocals) and Ben Morrison (guitar and vocals) of The Brothers Comatose grew up in a house that was known for its music parties. “The Morrison house was a gathering place for local musicians – everyone would bring an instrument, call out tunes, call out changes, and just play for hours” says Brothers Comatose bassist and Morrison music party goer, Gio Benedetti. “I learned more in that living room than in any class I ever took.” The brothers took this generous, inclusive and rowdy attitude and brought it to stages all over San Francisco. With the addition of members Philip Brezina (fiddle) and Ryan Avellone (mandolin) the string quintet brings their original string music and the feel of an intimate music party to audiences all across the United States. The environment the band creates with their music and their live shows isn't the exclusive band vs. crowd world of rock and pop, but rather the sing-along, stomp-along, inclusive world that gave birth to string band music. 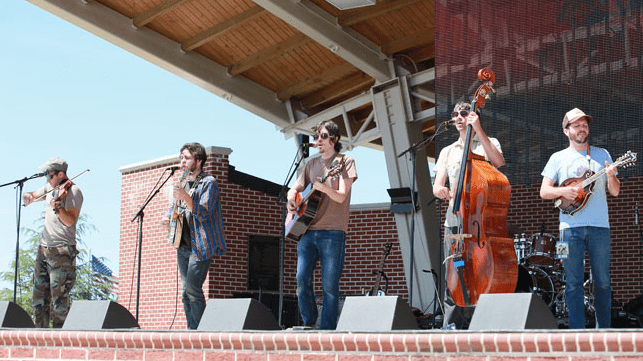 The band – while playing festivals like Hardly Strictly Bluegrass, Strawberry, High Sierra, Outside Lands, Kate Wolf, and SXSW, - has not lost sight of their roots, their fans and the relationships that have brought them where they are. Despite their name, the band is anything but Comatose. They toss alligators (inflatable) into the crowd, they hand out chopsticks for audience-percussion-participation, and are known to jump down and play acoustic encores in the middle of the crowd at the end of a set. It's just one, big, extended Morrison music party. Only now, the living room travels via Chevy G20 Conversion Van from state to state. “Create a Dream” is the theme for this year’s festival, which always aims to celebrate the arts.